Welcome to the Pikalily food blog. Today we are going to share with you our first recipe of the blog. This recipe is so easy to make and tastes incredible. We’re talking about homemade sweet potato and chorizo soup. Sweet potato is hugely versatile and packed with nutritional goodness including vitamins B6, C & D, Iron, Magnesium and Potassium. The nutrients work together to aid digestion, boost your immune system and increase energy levels. These are just some of the reasons why we love using sweet potato on a regular basis in the kitchen. Sweet potato is a great accompaniment for many foods. It is a hearty vegetable that works well throughout the year but especially during the winter months when roasted or added to soups. It’s natural sweetness works well with the smokey flavour that comes from spicy chorizo. 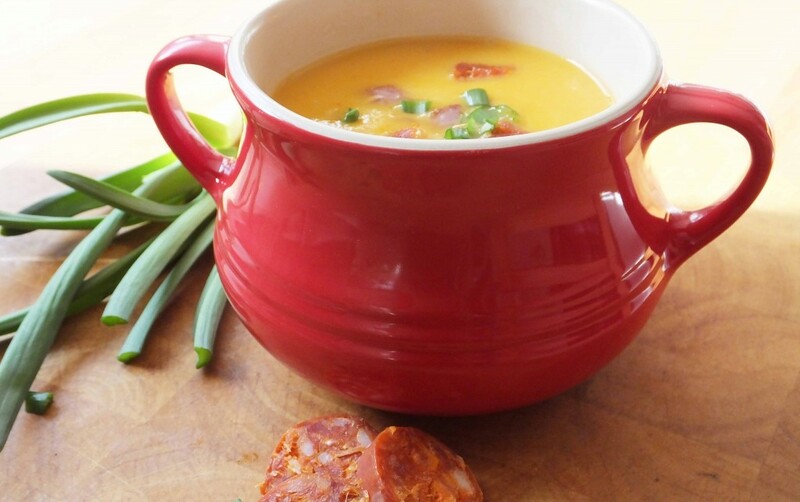 Chorizo is a great addition to soups as it is packed full of flavour and takes little preparation. Chorizo can also last in your fridge for months, allowing you to experiment in your kitchen over and over again. 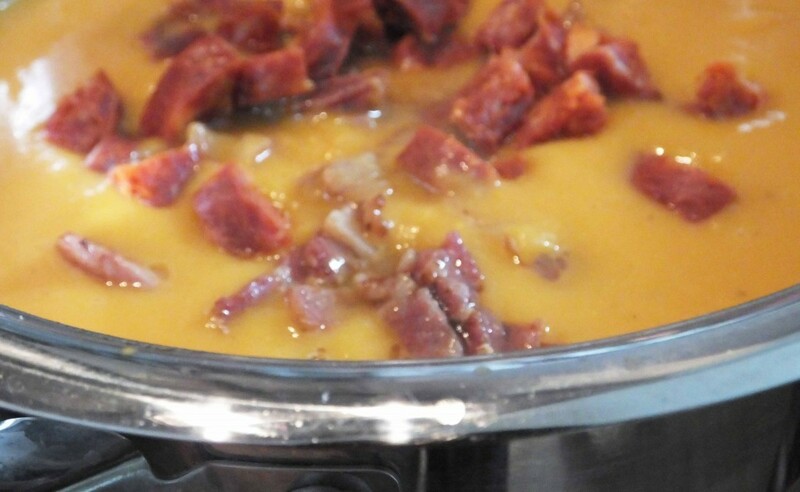 So, get your pot out and get ready to enjoy making a tasty (and easy to make) homemade sweet potato and chorizo soup. Cut the sweet potato into chunks that are approximately 1 inch wide. Place the potatoes in a deep pot with a knob of butter and allow the edges to brown and caramelise. This should take 3 – 4 minutes. Ensure you do not burn the edges. Add the diced apple and chicken stock to the sweet potatoes and bring to the boil. Once the stock begins to boil, simmer on a medium heat. After 20 – 25 minutes the potatoes should be soft but do check with a skewer. Season well. Transfer the mix to a blender or use a hand blender, being careful as the mixture is hot. Blend until smooth. 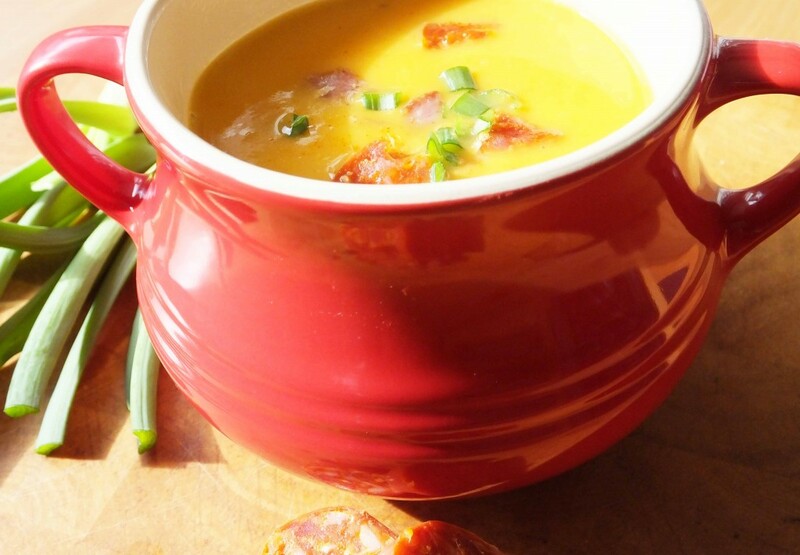 Add your chopped chorizo to the smooth sweet potato soup mixture and cook on a low to medium heat until the chorizo is warmed through (8 – 10 minutes). We also added some sliced streaky bacon here for extra flavour. Once the chorizo has warmed through you are now ready to serve and enjoy. Scoop your soup into bowls and serve with fresh bread, rolls or ciabatta. For an extra touch garnish with fresh, chopped parsley or spring onion. To really heat you up in the winter months add some chilli to taste and serve with a dollop of sour cream. This soup is perfect for kids (and adults) who can be a little fussy when it comes to eating vegetables as there is not a vegetable in site as you blend the soup. This is a dish that we’re sure all the family will enjoy.